Ducks are sold for $5. 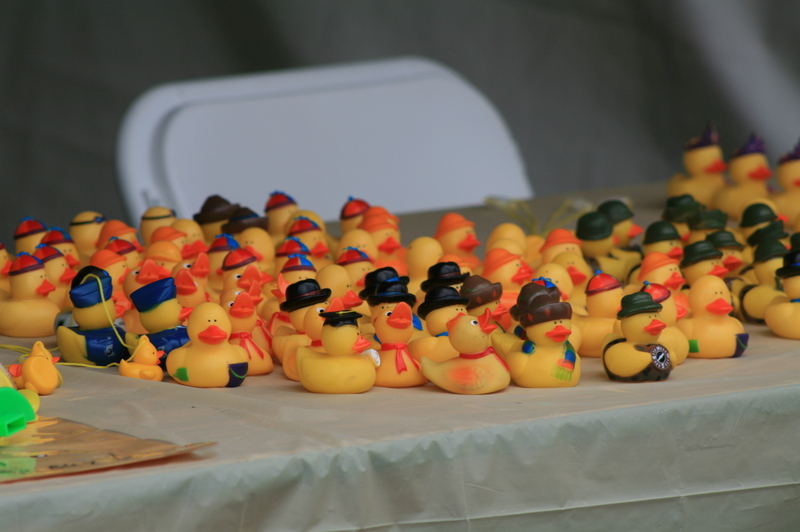 A multitude of prizes are available as ducks cross the finish line. Every community has something they’re known for far and wide. Say ‘Olympia!’ loud enough and someone’s bound to reply, ‘It’s the water!’ The Deschutes River’s rampant Tumwater Falls has brewed beer, spawned salmon and—every first Saturday in June—transformed into a racetrack for more than 10,000 yellow rubber ducks. Mike Marohn was the Lacey Rotary Club’s incoming president in the early 1990’s. 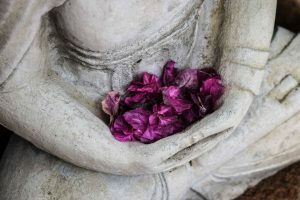 Their annual rose sale fundraiser had suffered over the past several years due to frost damaged plants and the club was uncertain they should continue. But, inspiration soon struck. 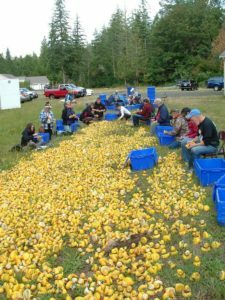 While traveling, Marohn came upon a community-hosted duck race and the rest is history. “It was great. And, you don’t have to worry about the vagaries of the weather and all that,” he recalls, and the first “flotilla of ducks” quickly came together. “I’ve spent all my life promoting events and concerts, but this was a new challenge,” recalls Marohn. “The first one was a real learning experience!” From the start, the Lacey Rotary partnered with the Olympia chapter of Trout Unlimited to monitor the finish line and collect wayward ducks after the race. This aspect of the event, in and of itself, is no easy task. 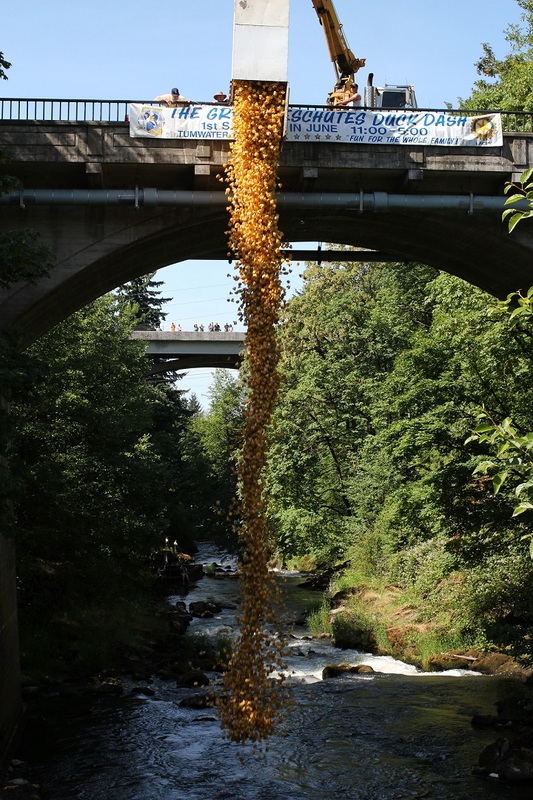 From humble beginnings of 2,000 to 2,500 ducks on the water, the event has maxed out at 12,000 ducks and requires a massive crane to lift the requisite crate high over the falls. As the waterfowl count grew, the event as a whole did too. Thanks to long-term sponsors like 94.5 ROXY, Lucky Eagle Casino and the Bruno and Evelyn Betti Foundation, “we’ve made some really great additions to make it longer and more of a festival,” says Marohn. 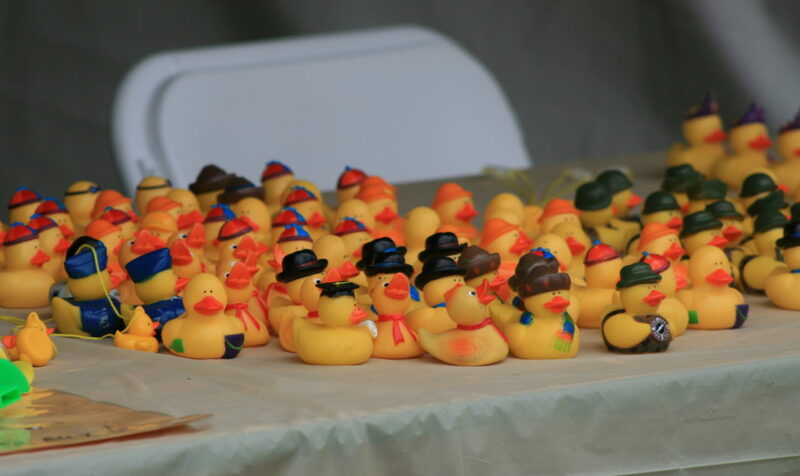 Sponsoring a duck is $5 each or $100 for a ‘whole flock.’ Awards in the early years came in the form of cash, but this year prizes galore will be handed out for the fastest finishers, including a Disneyland vacation for 4, goods, services, merchandise and, rumor has it, even a brand-new Ford Mustang. A member of the Lacey Rotary for 35 years, Mike joined originally at the suggestion of a business colleague. “It’s probably one of the best things I’ve ever done,” he recalls, “and a lot of fun, too.” Part of that fun is fulfilling the mission of Rotary – “Service Above Self”. This national mission plays out in communities around the nation and right here at home, when local clubs give back, working to better the lives of those around them. Ducks are sold for $5 each or $100 for a ‘flock.’ A multitude of prizes are available as ducks cross the finish line. At a recent celebration, the Lacey Rotary scholarship committee awarded 10 scholarships valued at more than $60,000 to local high school seniors who attend school within the North Thurston Public School service boundaries. Of these, five are 4-year renewable awards based on a student’s community activities and strong GPA. This exemplifies the many charitable activities of the Rotary and underscores the real reason for the fun Duck Dash event. 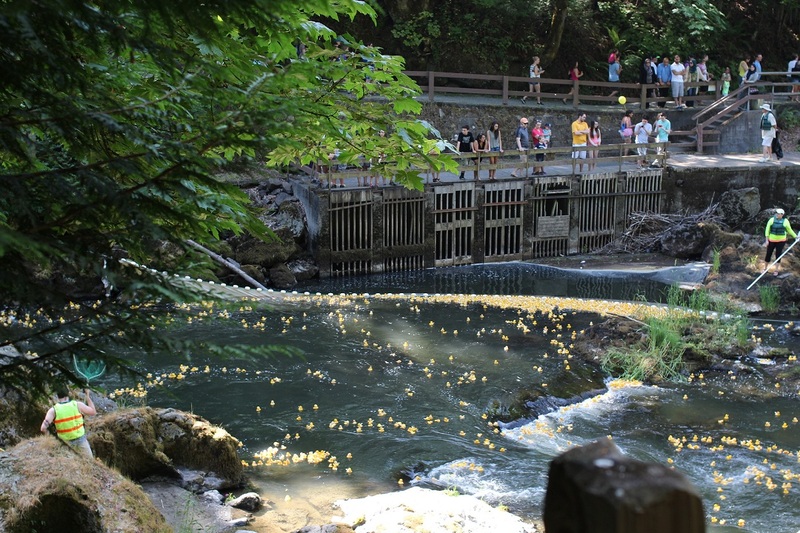 The Duck Dash runs from 11:00 a.m. until 5:00 p.m. on Saturday, June 3, with the drop taking place at 4:00 p.m. Come enjoy food carts, listen to local high school bands and enjoy bounce houses and activities for the kids throughout the day. Don’t miss out on drawings for over a dozen bicycles to be given away. Bikes are for all ages and sizes and the tickets to enter are free. Businesses and organizations interested in donating, sponsoring or participating in future events can contact the incoming president-elect Jim Burton at jaydeeburt33@aol.com. See photos, videos, updates and more on the event’s Facebook and other social media pages. 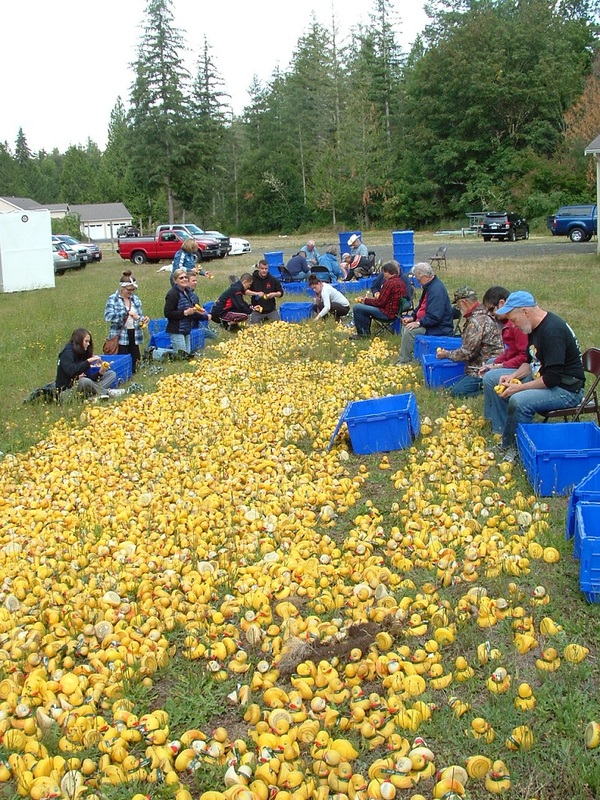 The Duck Dash is free but you can purchase ducks in advance at locations across the area or from any Lacey Rotary member. Maybe this year you’ll choose the first-place duck. But even if you don’t, everyone who supports the Lacey Rotary mission and enjoys the festivities at the Duck Dash goes home a winner.